Though they are generally regarded as low-maintenance pets, goldfish are susceptible to sickness like any other animal. Just like you would for your dog or cat, you can seek veterinary help for your fish. A goldfish is highly sensitive to changes in his environment; if you'll monitor him daily, you can have a better understanding of what may be the cause of his discomfort before consulting the doctor. While your goldfish may suffer from a variety of symptoms specific to his illness, other signs of poor health are common across different conditions. Look for these common symptoms, like a lack of appetite, irregular coloration, hiding or floating on the surface. Keep track of other symptoms you may notice, like ripped and torn fins or swelling, which can help your vet diagnose your fish's exact condition. When your goldfish is unwell, it may be the result of an environmental change. Before seeing a veterinarian, consider any adjustments you may have made to your goldfish's living conditions. For example, adding new fish to the tank could have changed the chemical composition of the water, stressed out the goldfish or limited his access to resources like food. If the water temperature has changed dramatically, such as if your homes air-conditioning started up for the first time in the spring, it could negatively affect your fish. Adding new fixtures that aren't sterile could potentially put goldfish at risk. These are just a few examples of the different ways that changes to the environment can have repercussions on your fish's health. 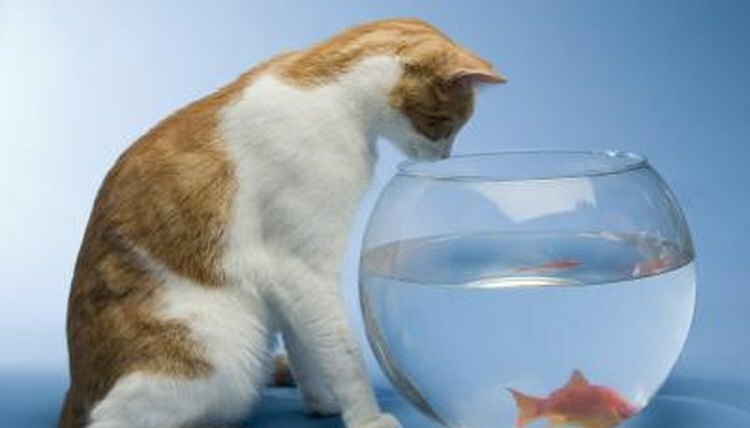 Find a veterinarian who specializes in caring for fish, particularly smaller and less exotic ones, like your goldfish. Though veterinary services for low-cost pets like goldfish were once uncommon, now you can find vets who administer services like checkups, blood work, ultrasounds and even surgery to your fish. In addition to performing procedures like these, your vet can also recommend or prescribe medications like antibiotics for treating your fish's condition. Based on your own observations and the recommendation of your veterinarian, treat your goldfish's apparent ailment. This may be as simple as feeding your fish less/more, regulating the temperature in his tank, cleaning the water more frequently or removing other fish from his environment. In other cases, follow the vet's instructions and follow up accordingly, tracking the progression of your fish's recovery and monitoring the condition of his symptoms. When Should You Worry About Your Betta? Why Do Jack Dempsey Cichlids Change Colors?